Celebrating Our Work | HURAH! At the end of a long day on the last day of my working trip with AUMOHD we gathered to celebrate. Milka, Paul, Moïse, Evel, me, Issa (and photographer, Gentilhomme). “EpiDor” is place on our main thoroughfare (Delmas) near the office, near home, and it is a fast food place with a difference. The name I think comes from the French or Creole meaning golden sword. Not really akin to the golden arches. The place has a little mascot that probably is a sword. In any case you can get burgers, chicken nuggets, salads, sandwiches, pastries. We bought a luscious strawberry cake to top off the celebration of the days in Cité Soleil, in Bainet, in Grand Ravin, and at the office and home trying to get our technology up to speed. 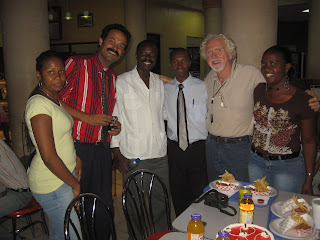 Just as we gathered we were visited by another neighbor, Moïse Jean-Charles, a well-known champion of the poor and human rights from the north and now working in the President’s office. What a nice reunion! I had worked with him in 2005 when he needed an international observer to help him convince the UN that the demonstration he wanted to hold concerning demands for a fair election would be peaceful and observed. 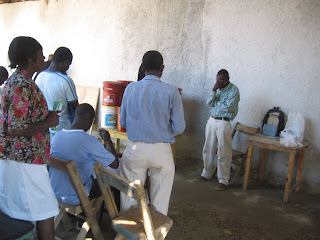 The water purification campaign continued last week with several more trips to Cité Soleil. 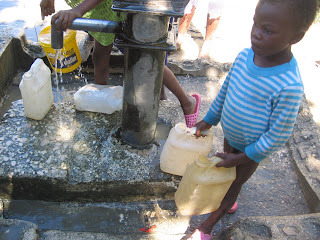 Here is a picture of just one of the dozens of community cisterns where residents must come to get their water. Because of the vulnerability of these cisterns to contamination the campaign is designed to raise awareness of the need to purify water in the cisterns as well as in the containers that are brought home. 13+ different neighborhoods in the vast inner city section called Cité Soleil (300,000 people) were organized tightly in teams of 1-2 people who took responsibility for taking a seminar in water purification, for advising their neighbors, and for delivering Chlorox and Aquatabs for the actually purification process. Each area has 1-3 community cisterns with water pumps. The water needs purifying in the cistern and in the home as well as it is kept in containers. AUMOHD gathered buckets for demonstrating in houses the process of decontaminating and keeping it pure with covers. These neighborhoods are not in the center of Cité Soleil and were feeling abandoned by all the authorities and service groups. AUMOHD, our partner, worked hard (see my post earlier) to calm things down and bring the Mayor and the people together. Here is a picture of the water purifcation seminar about to get underway. The leader is a member of the water commission and he volunteered his time. All the group leaders were volunteers as well, residents of the areas. This scenen captures the group in a beginning meditation and prayer. 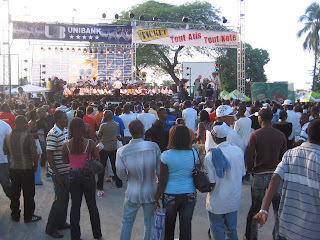 As my 21 days drew to a close I was taken on Sunday, Nov. 18 to Musique En Folie, now in its 2nd or third year of featuring Haitian musicians and their CD’s It includes a festival of food and booths with many exhibitors including one for women’s rights and for services to alcoholics. Most of the crowd was young and laid back with lots of young parents with children.